First of all, I’m glad Lim6 is using less CPU in Reaper, my DAW of choice for mastering. Second, the new GUI is killer!! Hey vladg! Tokyo Dawn Labs informed that Nova-67P would be released soon with the regular TDL GUI, so I was wondering what are the chances that Limit no.6 would have a TDL GUI too? We are goint to release Tokyo Dawn Limiter No6 after Nova-67P release. Yes, Limiter No6 will have TDL look. I was using Limit no6 yesterday on a track when that thought came to mind. Can’t believe it’s actually gonna happen. Yes, the regular GUI is the weakest point (unlike Molot, mind you). Not too push it, but when can we expect Nova and Limit to be released by TDL? Hey, Vlad… Just wanted to thank you for the great work you carry on. 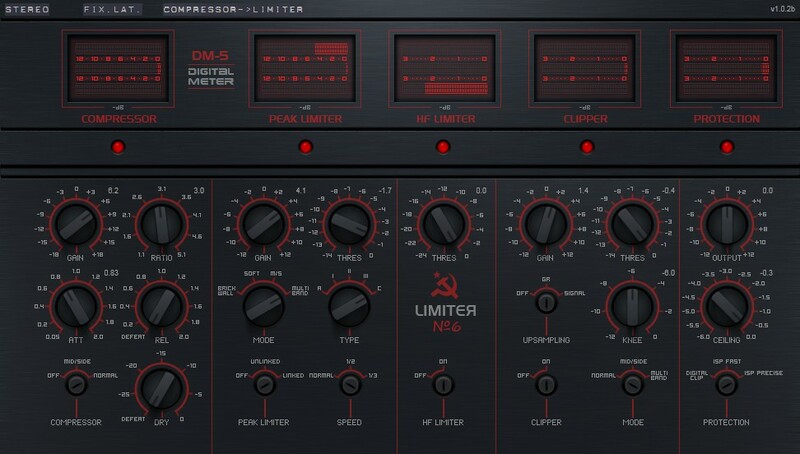 LimiterNo6 is a long lasting limiter in my files, only now I’m capable of grasping the full advantage of the great free tool. Thanks a lot for making it free and BIG UP. Mac download link goes to Limiter6-ENV1.dmg file, which is for Mac, doesn’t it? Just wondering on TDL and your plans for NO. 6 and Molot GE editions.. I am stoked and looking forward to any news of progress. Thanks. Hi Vlad, just wanna say thank you for your great work and sharing it with us! I use it in every mastering session an it works and sounds so smooth and transparent at the same time. I rather prefer the sound instead of GUI, but this clean and smooth GUI just rounds it up. Thank you! Good idea to make ENV1 skin default because I’m happy user of it too. How do I delete a preset within Limiter6 that I made by mistake? I cannot find this information anywhere. Thanks so much! The links are down, is there any way I can get them? (Mac AU) Thanks!